Genevieve Lucille McGowan was born on March 28, 1921 at home in Hewitt, Minnesota. Her parents were the late Cordy and Alice (Swenson) McGowan. When Genevieve was growing up she enjoyed helping her Dad with the horses, she would ride them before he knew if he could trust them. On September 11, 1937 Genevieve was united in marriage to Harvey Helmbrecht in Wadena, Minnesota. Their marriage was blessed with four sons: Duane, Donald, Dale and Delwyn. Genevieve and Harvey resided in the Henning and Deer Creek where they farmed, and Harvey also was employed doing concrete work in Fergus Falls. Genevieve raised her sons and helped on the farm. Harvey passed away on August 21, 1970. Genevieve made her home in town where she enjoyed volunteering at the nursing home and the Senior Citizens Center. She loved making quilts with the UMC ladies and helping with the church bizarre. Genevieve enjoyed gardening, her flowers, reading, writing & receiving letters, puzzles, collecting spoons, salt & pepper shakers and making rugs and quilts. She tried to give everyone special to her a quilt for graduation, weddings and babies as her family grew. She loved cats for company, as her favorite for the past years was “Kitty”. The times she loved the most were the special family get togethers. 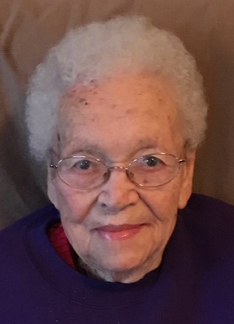 On August 17, 2018 Genevieve passed away peacefully at Perham Living in Perham, Minnesota at 97 years of age. She will be dearly missed by her family and friends. Preceding Genevieve in death were her parents; husband, Harvey; sons: Duane, Donald and Dale; brother, LaVerne (Esther) McGowan; brother-in-law, Charlie Stromback and grandson, Ronald Helmbrecht. Genevieve is survived by her son and daughter-in-law, Delwyn and Sue Helmbrecht of Henning, Minnesota; 11 grandchildren: Randy (Kathy); Don (Linda); Wade (Kaija); Wally (Cara); Kevin (Shawnie); Cory (Kristy); Chris; DJ (Geoff); Rhonda (Tim); Lisa (Carl) and Kim; 29 great-grandchildren; 20 great-great-grandchildren and 2 more on the way; sister, Arlene (Dwight) Stromback-Gustafson; nieces, nephews, many other relatives and a host of friends.